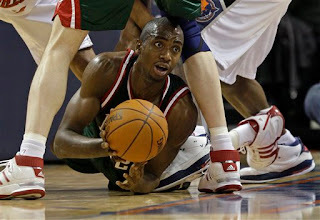 Bucks Beat Bobcats in a Snoozer ~ The Bucky Channel - The World of Sports from Wisconsin's Perspective. When you see 79-74 as an NBA score, it means either one of three things. 1) It's a defensive battle. 2) Nobody is hitting shots. 3) It's only the third quarter. In Saturday's Bucks/Bobcats game, it was more poor shooting than anything else. But it really didn't matter how bad the Bucks may or may not have shot, because the Bobcats are a terrible basketball team. Weren't they supposed to be good by now? Wasn't that the goal, to not spend a lot of money at first, groom the young guys, and eventually be competitive? When is that going to happen? As for the Bucks, these back-to-back wins in the last couple of nights have them back to one game under .500. Tonight they were lead by Ramon Sessions and his 10-10 free throw shooting, which helped keep the Bucks in front for much of the game. He finished with 18 on the night, while Villanueva and Jefferson each had 15. Sessions gets The Bucky Channel Player of the Game, and here's the box score for B.